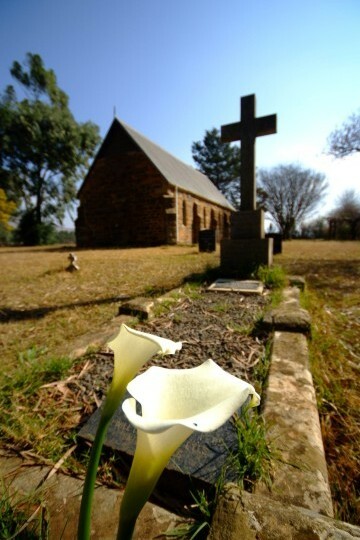 Like so many rural Anglican Churches, St Peter’s, situated in a rather remote area of Natal, under the shadow of the Drakensberg, was motivated by the demand of local faithful, long used to meeting in private homes, to create a place of worship for the region’s farming community. St Peters was built on farmland donated by Henry Lang who also played a major role in its construction. The materials for the building were carted all the way from Rosetta siding by Arthur Ratsey. Built of stone under an iron roof, it remains a most attractive rustic church in the traditional English style. Funding was entirely through private donations by the locals. A small graveyard recalls the names of many donors. The most intriguing memorial is that of the Hamilton family which records Mary Hamilton, aged 10 months, was buried there in August 1911, Barbara Hamilton, aged 30 months, in April 1912, Noel Hamilton aged 6 months in June 1912, Jeannie Hamilton buried in June 1916 aged 7 months and Natalie Hamilton aged only 3 was interned in January 1918. There are no church records of the Hamiltons, their lives and tragedies remain a mystery. St Peter’s was consecrated in 1907 by Bishop Baines who was obviously very active in the Midlands of Natal. The strength of the Anglican community can be judged by the size of the congregation with 91 souls attending the first of its monthly services.